We can also be reached by email at GoodwinArcheryCoach@gmail.com, or on our Facebook page. At Goodwin Archery, our aim is to help your aim! We offer coaching and mentoring for individuals wishing to improve their archery skills. Our specialty is in Target Archery, both indoor and outdoor, in both USA Archery and National Field Archery Association formats. We work with archers of all ages and all skill levels. 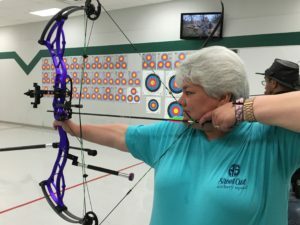 We have years of experience working with USA Archery JOAD programs (Junior Olympic Archery Development) and Boy Scout and Girl Scout programs. We are certified merit badge counselors for the Boy Scouts of America. 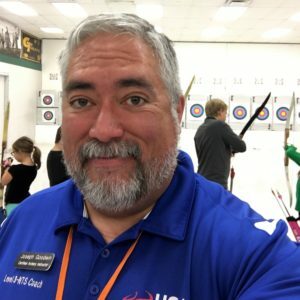 Joe Goodwin is a Level 3 NTS Coach certified by USA Archery, as well as an NRA-certified instructor in rifle, pistol and shotgun. He served for ten years as the Shooting Sports chair for the Last Frontier Council of the Boy Scouts of America. Joe is a regular competitor in the state of Oklahoma, and recently won the 2017 Oklahoma-USA Archery indoor title in Men’s Masters Compound. He primarily shoots Freestyle Compound, and has also competed in Bowhunter Compound and Barebow Recurve disciplines. 2016 Senior Women’s Compound Champion, NFAA Southern Sectional (indoor). 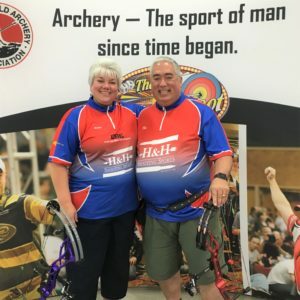 Both Joseph and Stacey are active coaches with the Oklahoma Redhawk Archery Team and the Trosper Archery Club JOAD programs in Oklahoma City, OK.